Review date: 8 May 2003. You can't fault Via Technologies for persistence with their C3 processor. More than a year and a half ago, now, I checked out an 800MHz C3. Back then, C3s were Socket 370 processors that didn't draw a lot of power, and were fast enough for business applications. But they had lousy price-performance compared with Intel processors for the same socket. They weren't much cheaper (if at all), and they were quite a lot slower. If C3s cost ten bucks then their lousy performance wouldn't have mattered; they were still more than fast enough for what most computers do most of the time, and what many computers do all of the time. But the price killed 'em. Socket 370 C3s still exist, and their sales figures are continuing to fail to set the world alight. Fortunately, Via came up with a better way to sell them. Behold - EPIA motherboards. 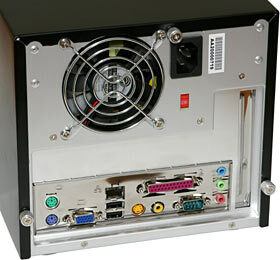 In the Mini-ITX form factor. For when microATX and FlexATX are just too darned big. Mini-ITX boards definitely qualify as Small Form Factor (SFF) components. They're only 17 centimetres square; less than four tenths of the footprint of a standard ATX motherboard. This means they can fit into very small cases. If you're looking for a PC that'll fit in a humidor or C64 casing, then a Mini-ITX board is the way to go. An EPIA is about the most concentrated dose of standard-x86 computing you're likely to find. Video, sound, network adapter? All built in. As is the CPU; it's soldered right onto the board. Just add some RAM, and your EPIA motherboard is ready to connect to a power supply and drives. The processor on an EPIA board can be a C3, or it can be one of Via's ultra-low-power Eden chips. The Edens draw so little juice that they don't even need a fan on their heat sink. Via originally claimed the C3 would also be able to get away without a CPU fan, but in the real world, you need a pretty big heat sink and lots of case ventilation for that to work. The Eden is the real fanless deal, but it's not fast. For everyday computing using today's slim and speedy Microsoft operating systems, you want at least a C3. The EPIA on the right in the above picture, with no fan on its processor heat sink, is an Eden board; it's the "ME6000". Here in Australia, Aus PC Market currently stock it for $AU283.80, delivered. These little shoebox cases are popular habitats for EPIA boards. They've got enough room for a normal complement of drives (one optical, one floppy, one hard), they're tall enough that you can fit a normal expansion card in if you want, and they look spiffy. This one's a black Skyhawk IMC-6261. It's made of aluminium, its fit and finish are good, it's got neat-o high intensity green and yellow LEDs for power and drive activity, and it costs $AU203.50 delivered from Aus PC (Aussies can click here to order one). It's not a perfect match for the EPIA boards - the USB and audio connectors on the front panel have cables that suit the older Standard-Data-Rate-memory EPIAs, but not these new DDR ones - but it does the job. 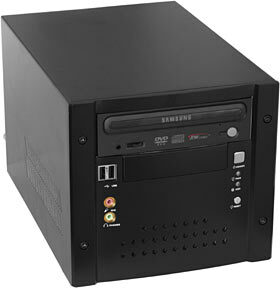 The black-fronted optical drive, by the way, is a Samsung combination CD-RW/DVD unit, yours for $AU192.50 delivered. Aus PC also do combo deals - this case with this drive and an M10000 pre-installed is $AU698.50 delivered, for instance. All of the "M-Series" EPIA boards take PC2100 DDR memory (or faster, but don't expect more than PC2100 speed), and have a bunch of other mod cons. They can run UDMA/133 hard drives at full speed, they've got USB 2.0 and FireWire headers onboard (plus the usual couple of USB 2.0 ports on the back connector block), they've got six channel AC '97 audio, and the list goes on. People looking for a "Home Theatre PC" (HTPC) will be interested by the extra video and audio outputs; there's both S-Video and composite video out, and the composite RCA connector can be switched to work as an S/PDIF digital audio output. The living room PC market, however, generally wants a processor that's fast enough to play CPU-intensive video. MPEG and MPEG-2 stuff, the EPIA boards can handle. The ProSavage CLE266 chipset the M-Series boards has an MPEG decoder built in now, so these machines should be A-OK for MPEG video files and DVD playback. The M10000 worked fine for high-data-rate MPEG files and DVD playback when I tried it. Many people's perfectly legally acquired video files, though, are encoded using some other codec. Those codecs tend to be very CPU-intensive. Practically any AMD or Intel CPU made in the last few years will be able to handle video playback adequately - your old 700MHz Duron box may not be able to do much else while it's playing a DVD rip full screen, but you'll probably be fine with that. C3s, however, have thus far not been up to the task. The C3 has been getting faster since I last checked one out. Its core speed has climbed, and it's also gone through a few drastic core revisions. As part of Via's continuing attempt to teach the world's geeks the books of the Old Testament by stealth, the original C3's Samuel 2 core begat Ezra (the one I reviewed last time), which begat Ezra-T, which begat the new Nehemiah. The Nehemiah core powers the C3 1.0A; that isn't what powers the 1GHz C3 on the M10000 I got for review, though. It's an Ezra-T. The Nehemiah C3 is now using an IDT WinChip core. Via absorbed IDT's CPU division a while ago, just as they'd soaked up the Cyrix and Centaur CPU operations that provided previous C3s and the earlier "Via Cyrix III". The WinChip core ought to be a significant step forward, primarily because the Floating Point Unit (FPU) inside it is finally running at full core speed, instead of half speed. It also finally supports the SSE instruction set extensions. The boring-business-box market for the C3 doesn't care much about floating point speed and "multimedia extensions"; business apps do little or no floating point work, and only care about integer performance, which is good enough in the C3s. But if you're playing 3D games or video files - which you may well be doing, on your funky little living room PC - you're likely to care a lot more about FPU speed. The other big buzzword improvement in the Nehemiah core, by the way, is the "powerful PadLock™ Data Encryption Engine". This is basically just an ingenious high quality random number generator that, if you're using encryption software that hooks into it, increases the security of random-number-based encryption schemes. There's no software that supports it yet, though. While I'm wandering off the main topic, I feel I should mention that I'm not sure what "EPIA" stands for. Enhanced Performance I-something Architecture? Embedded Processor Information Appliance? Via like all-caps names; they want everyone to call them VIA, although V-I-A doesn't stand for anything. So maybe this is just another one of those. EPIA does stand for something, but I'm pretty sure that's not right. Ahem. Getting back on track. There's this little case, and there's an M10000 board inside it, powered by the not-quite-newest version of the C3. And some other stuff. It's easy to get into the Skyhawk case; the slide-off top-and-sides piece is retained by three thumbscrews. It's also quite easy to work on, as these things go; there's a transverse-mount 3.5 inch bay for the hard drive which you can remove to install the drive, and the 5.25 inch and floppy bays are perfectly normal. If you don't need a floppy drive (many people don't, these days) you could shoehorn another hard drive in there and turn this little box into a really startlingly capacious MP3 server, or what-have-you. The Skyhawk case's motherboard mounting location has enough room around it that you won't be knocking caps off your EPIA board if you're installing it yourself. There's also enough air space around the compact 200 watt power supply that its pleasingly standard 80mm exhaust fan (many tiny boxes have ineffectively weeny fans) ought to keep the case well ventilated. ...this. It comes with the M-Series boards, it plugs into the motherboard, and it gives you your extra two USB ports, and your two FireWire ports. And now: Cruelty To A Baby CPU! 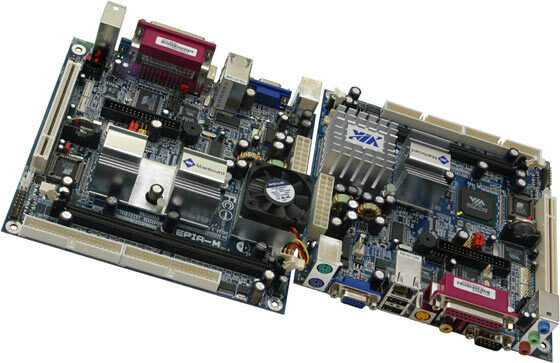 In the olden days, budget priced all-in-one motherboards were seriously nasty. Driver issues, reliability problems, and truly miserable performance. Even for office applications. This is not the case with the EPIAs, even the older pre-DDR ones. The M-Series boards will be happy as clams running office apps on Windows XP. You'll need to pack some pretty serious memory into that single DIMM slot to get XP humming, but 512Mb PC-2700 DDR modules now only cost about $AU125, so that's really not a big deal. Has 1GHz clock speed and DDR memory allowed the M10000 combo to cast off the Curse of the God-Awful FPU? Because I was expecting this system to perform like top-of-the-range machines of a few years ago, I started by bouncing a few elderly benchmarks off it. Good old WinTune - the now-defunct Windows Magazine's standard quick and dirty benchmark - reckoned the M10000 scored 1262 million integer instructions per second (MIPS) and a big 252 million floating point instructions per second (MFLOPS). This is a totally synthetic tiny-bench with little relevance to real world tasks, but a big difference in synthetic MIPS or MFLOPS scores does, generally, mean a noticeable difference in real world performance. The humble 1.5GHz DDR-RAM Athlon XP machine I'm typing this on scored 4519 MIPS and 1844 MFLOPS - 3.6 and 7.3 times faster, respectively. Even if you allow for its higher clock speed, it's still 2.4 and 4.9 times faster. I really, really hope the full-speed Nehemiah FPU improves this situation. 200MHz more core speed clearly hasn't done much. WinTune also has some lightweight "application simulation" tests for integer, floating point and MMX operations. The Athlon beat it senseless for those, too. The 1GHz Ezra-T C3's performance was pretty underwhelming compared with the SDR-memoried 800MHz Ezra C3 I reviewed last time. The newer CPU scored better across the board of the WinTune CPU tests than the Ezra, as you'd expect given its higher clock speed, but once I corrected for clock speed, it was pretty much exactly the same speed as the Ezra. It lost by 17% in the MIPS test. C3-versus-C3 tests aren't of much interest to most people, of course; they want to know how the C3 stacks up against better known CPUs. Well, I compared the 800MHz Ezra C3 with a 500MHz P-III last time, and it lost by a fair bit for integer tests and by a lot for FPU tests; the 1GHz Ezra-T C3 still loses. Just by a somewhat smaller amount. To a 500MHz P-III. Yeesh. OK, let's try something a bit more real-world. Via say this processor's good for multimedia stuff, so it should do OK in PCMark2002, right? Hmm. CPU score 913, memory score 738. And, as I sat there and watched PCMark 2002 Pro work its way through its video tests, yea, did I witness nasty pauses and hiccups. Nasty pauses and hiccups are not what you want from a home theatre PC, but I saw 'em when I played big fat AVI files on the M10000, too. I fired up the simple 1.8GHz Celeron box I built for this piece, which is outfitted with the rip-snorting budget graphics power of a GeForce4 MX440 card, and tried PCMark2002 on that. It scored 4021 and 3288 for CPU and memory. I like to run distributed.net benchmarks on new processors, if only to make my d.net score look more impressive, so I gave the M10000 a go at that. It was, I am happy to say, a bit faster than the crusty old 350MHz P-II box I use as a printer/scanner server. It was, however, smacked down by a factor of more than four for both the RC5 and OGR benchmarks by my 1.5GHz Athlon. Correcting for clock speed, the Athlon still won by factors of 2.7 and 2.8, respectively. You can't even buy 1.5GHz Athlon XPs from many stores any more. It's just mean to test a C3-and-ProSavage machine with 3DMark03, so I didn't. 3DMark2001 SE ran OK, though. Well, "OK" in the sense that it didn't crash, anyway; the default benchmark gave the M10000 a result of only 375 3DMarks. It's not just the M10000's same-day service ProSavage graphics holding the C3 back, here. The 1.8GHz Celeron box I mention above has a ProSavage-equipped motherboard, and not a very new one, either. Using that graphics adapter, its 3DMark2001 SE score is 554 3DMarks, almost 1.5 times the M10000's result. Five-hundred-and-something 3DMarks is still a quite disastrous result, mind you; the GeForce4 MX440 boosts the Celeron box's score to 4638 3DMarks. But, clearly, the 1GHz C3 is so slow that it can even hold up a ProSavage video adapter. OK, let's get crazy with the old school benches and try Quake 2. In OpenGL mode, 320 by 240, Q2's demo2.dm2 trundled past at 30.7fps. The non-studliness of the ProSavage adapter is indicated by the fact that switching to software-rendered mode at this resolution raised the frame rate, to 41.4. At 640 by 480, though, OpenGL mode was (heavens be praised) faster than software; it managed 31.2fps to software's 20.8fps. The worst-case-scenario Crusher multiplayer demo zipped by (relatively speaking) at 27.9fps in 320 by 240 software mode; in 640 by 480 OpenGL it chugged and ground its way to a 16.3fps score. Once upon a time, I had a pimped-out gaming rig that performed like this. 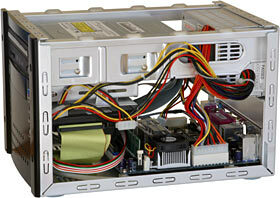 It had a Covington-core Slot 1 Celeron overclocked from 300 to 450MHz, and a 3dfx Voodoo 1 card. I could have kept on beating the C3 about the head and body with benchmark software, but I didn't. Check out this other review if you need to see some pretty graphs; they got a Nehemiah-core C3 to play with and discovered, in a nutshell, that it's usefully faster than the 1GHz Ezra-T, but still not by enough to put it ahead of budget Intel and AMD chips. As part of my rigorous going-the-extra-mile, no-job-is-too-difficult testing program, I took the M10000 box to a party. To test its suitability as a mobile TV-output music station, naturally. It performed perfectly well, except for three things. One: The 1GHz Ezra-T C3's more than capable of playing MP3s (thank goodness), but it doesn't have enough grunt to run most Advanced Visualization Studio presets at a decent frame rate. Most AVS presets are enormous CPU hogs; even steaming monster-systems won't be able to get smooth AVS eye candy displays happening at anything like their usual Windows desktop resolution. But no resolution was low enough, even with pixel doubling reducing the actual resolution by half each way, to get more than a-frame-and-a-bit-per-second from many AVS presets on the M10000. The second oddity I noticed while using the M10000 box as a TV-connected MP3 jukebox was that while the TV output quality wasn't too bad, the lowest resolution I could use for the Windows XP desktop was 800 by 600. This is Windows' fault, not the M10000's; it's alleged to be a feature, not a bug. 800 by 600's too high for display on ordinary TVs; even 640 by 480's likely to be pretty fuzzy. After the party (which involved a fair bit of squinting at the various text that I couldn't make bigger), I discovered that I could wind the resolution down to 640 by 480 by using Powerstrip. Problem three: The partygoers found the Logitech MX 700 mouse I brought along a lot cooler than the tiny little PC. I installed Mandrake 9.1 on it. It worked. Everything was detected OK. The C3's a low power processor, electrically speaking; Via quote about 10 watt power consumption for it. Computers have a lot more in them than a processor, though, and reducing the power consumption of the CPU won't necessarily make a big difference to the overall power consumed. To see how much juice the M10000 drew, I plugged in my Scary Deadly Power Cable Of Doom with in-line RMS ammeter, and put the box through its paces. I only measured the current going to the system box, not to the monitor. During startup, the M10000 system drew from 0.35 to 0.39 amps, which from a nominal 220 volt supply is about 77 to 86 watts. With Windows loaded and nothing going on, it drew about 0.3 amps - 66 watts - when there was something in its CD/DVD drive, or about 0.26A - 57 watts - with that drive empty. The most I could make it draw by running an OpenGL game was 0.4A; 88 watts. That's also what it drew when playing a DVD. Interestingly, the difference between the power draw when the M10000 was running the distributed.net cracker but nothing else of consequence, and its draw after I quit out of the cracker, was about 0.09A. That's about a 20 watt difference, and it's pretty much all got to be down to the CPU; distributed.net doesn't hit RAM very hard, and its disk usage approaches zero. So much for that ten watt CPU power figure. Now, I've previously established that a 400MHz Celeron system drew a peak current of about 8.5 DC amps from a 12 volt battery (fewer volts means more amps for the same power), when it's running from an old inverter that probably dreams of having 90% efficiency. That machine's quiescent doing-nothing current, with its hard drive still spinning, is less than 6A from 12V. That means something in the order of 110 to 120 watts peak, and around 80 or 85 watts quiescent. Given that the 400MHz Celeron is roughly equal with the M10000 machine for performance, there wouldn't appear to be much of an advantage to the C3 box, power-wise. Compared with a current P4 or Athlon, it'd be a big winner; those things are sucking the thick end of a hundred watts just for the CPU, and you can add several tens of watts more if you're running a fancy 3D card, before you even start looking at the power consumption of the other components in the system. But if you're under the impression that an EPIA system kitted out with normal drives and doing normal tasks is an amazing 20 watt wonder - sorry, but it isn't. I've been making such a big deal of the C3's continuing unexciting performance partly because I just like being cruel, but mainly because Via keep banging on about how "the new VIA C3 delivers exceptional performance for all the most critical productivity, Internet, and digital media applications". The M-Series boards are supposed to give you a "rich multimedia experience". The M10000's certainly fast enough for many purposes, and it's quite well priced, and these tiny EPIA boards are cute as buttons and genuinely handy for anybody who wants a little unobtrusive PC that can be stuck in a backpack for transport by even the most biscuit-shouldered geek. But the Ezra-T-core 1GHz C3 substantially underperforms four-year-old AMD and Intel processors, and the Nehemiah core would appear to not be better enough to make it a contender. If "multimedia" means "video file playback, and maybe some 3D games" to you, this is not the processor to choose. The Ezra-T M10000 was perfectly OK for MPEG video file playback, and for DVD playback using the Cyberlink PowerDVD XP package that came with the combination optical drive. But it didn't take much of a DivX file to give it pause. And then another pause. And then some more pauses, and maybe some dropped frames. You can wring better 3D performance out of an M10000 by giving it a faster graphics adapter. That'll also give you a bit more free RAM, as the built-in ProSavage adapter steals 32Mb of memory for its own use. 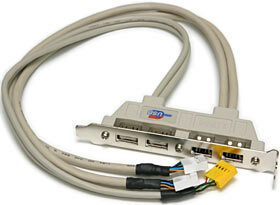 The EPIA boards only have a PCI slot, though, which severely constrains your graphics card choice. And a new graphics card won't make the system any better for playing back video files. Replacing onboard graphics with a proper video card is a standard trick to make Small Form Factor PCs that can genuinely do it all. The SFF PCs that people start with when they do this, though, are not C3 based; they're generally Socket 478 boxes, which give you the option of installing a cheap Socket 478 Celeron or a full-fledged P4. To see what I'm talking about, check this out. Chyang Fun's CF-S968L is tiny little case with a handle, a window, and a P4 motherboard built in. There's one PCI slot and one AGP, so you can replace the unexciting on-board graphics with something better, if 3D games matter to you. If they don't, then the processing power of even a modest Socket 478 Celeron will be more than enough to handle everything else that the C3 can't. You'll pay for the privilege, of course. Aus PC Market stock the CF-S968L for $AU660 delivered, without processor, drives or RAM (Aussie shoppers can check it out here). That's only about $AU40 cheaper than the M10000 combo deal, which includes an optical drive and processor; a CF-S968L-based computer with an AGP graphics card could easily cost you several hundred Australian dollars more than an M10000 machine. But that's just what you've got to pay, I'm afraid, if you want to stuff proper PC power into a tiny box. The M10000 is far from useless; it'll suit many people, definitely including business users, just fine. The Nehemiah core and about a 1.5GHz clock speed might even put it into real HTPC contention. But, as it stands, it does not live up to Via's claims. Readers from Australia or New Zealand can purchase EPIA machines from Aus PC Market.